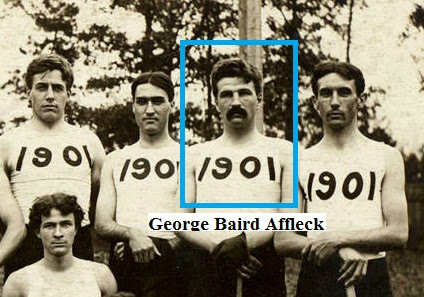 George Baird Affleck played field hockey for the class of 1901 at the YMCA Training School (now Springfield College) under James McCurdy. After his graduation, Affleck became director of physical training at the Iowa State Normal School (now known as Northern Iowa University). He stayed there through 1907, then returned to the Training School until his retirement in 1941. In Springfield he coached the men’s soccer team and was awarded the college’s Tarbell Medallion for outstanding service in 1944. All of which makes for a very interesting life, but the reason I’m now trying to learn more about him is something he did at the Iowa State Normal School upon his arrival in 1901: he introduced field hockey. There it was played by both men and women on an intramural basis through 1908, at which point the men’s program began to decline. Women continued to play, though, and based on what I’ve read the school seems to have joined the United States Field Hockey Association in 1923. I have found other references to schools in Iowa playing field hockey in the early 1900s. Women’s teams from Coe College and Iowa State are alleged to have played each other in 1906, and I have found at least one reference to a game between Coe and Cornell College the following year. I don’t yet know for sure, but I’m curious to learn if Coe and Iowa State picked up the sport as a direct result of Affleck’s arrival at the Normal School. This would represent at least one sustained outbreak of women’s college field hockey in the United States entirely unrelated to the efforts of Constance Applebee. Posted on December 17, 2014 March 16, 2016 by Eric MeanyTagged Coe College, Constance Applebee, Cornell College, George Affleck, Iowa State, James McCurdy, Northern Iowa, Springfield.